CHILTON - Gail Marsha (Lawrenz) Engler, age 74, of Chilton, Wis., was born into eternal life Tuesday, May 3, 2011. Gail was born March 18, 1937, daughter of the late Florence (Lucht) Lawrenz Schroeder and Royal H. Lawrenz, in South Milwaukee, and lived for a short time in Racine, before moving to Shorewood Hills in Madison. 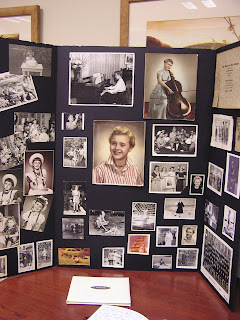 Gail was a 1955 Madison West High School graduate where she was active in leadership roles including Student Council as vice president, Girl Scouts, potlucks, church groups and the debate team. She went on to graduate from UW-Madison in 1959 with a major in history and English and a minor in Spanish. Her first job was as a teacher at Central High School in Madison. She married William Engler Jr. on Aug. 29, 1959. Gail and Bill moved to Chilton, in 1961, where her husband began his legal career while Gail became a homemaker raising six children. Inspired by her own high school AFS (American Field Service) experience in Finland, Gail was an integral part of initiating the first AFS chapter in Chilton in 1961, a program that is still going strong today. In 1984, Gail joined P.E.O., Chapter AT, a favorite organization of her mother's, where women celebrate the advancement of women, educating through scholarships, grants, awards, loans and stewardship of Cottey College, as well as motivating women to achieve their highest aspirations. Gail was instrumental in the development and building of the Kaytee Avian Education Center in 1995. She was on the board of directors of the Chilton Camp Fire Girls and the North Eastern Wisconsin Land Trust. Gail also was a member of the Grants' Committee for both the Community Foundation for the Fox Valley, Region, Inc. and of the Chilton Area Community Foundation. Gail was selected as Chilton's "Distinguished Citizen of the Year" in 1982. Gail was a member of Good Shepherd Parish (formerly St. Mary's). She shared her love of teaching history and her knowledge of her Catholic faith by serving as a CCD high school religious education teacher for many years. Her love of the performing arts and her interest in student development, led Gail and Bill to be major contributors to the Engler Center for Performing Arts, one of the finest performing arts' facilities in the area. Funeral services for L. Irene Buck, 65, of 10017 Merrill Springs rd., supervisor of art in the Madison public schools for 30 years who died Saturday at a hospital here, will be at 2 p.m. Tuesday at the Fitch-Lawrence funeral home with the Rev. Max Gaebler officiating. Instrumental is developing art education in Madison, she was largely responsible for the annual Salon of School Art at the Madison Free Library. Miss Buck became ill at her home two weeks ago and entered the hospital Monday. Born in Lansing, Mich., she received an art degree from the Chicago Art Institute in 1910. After further work at Columbia University she taught at Hillside school near Spring Green -- the buildings that now house Frank Lloyd Wright's School at Taliesin. Later she taught at Park Ridge, Ill. and then came to Madison high school (now Central). Her philosophy of teaching was the encouragement of creativeness through freedom of expression, rather than through strict discipline. When she was teaching in Madison, she took advanced courses at the University of Wisconsin and Columbia. Miss Buck is a past president of the Madison Art Assn. of which she was an active member, and she had also been president of Altrusa. Surviving is one brother, Carroll W. Buck, of Chicago, Ill.
Friends are requested to omit flowers and asked to donate to the American Cancer Society instead. Originally published in the Wisconsin State Journal on February 15, 1953. At this time, obituaries were still "news stories," written by newspaper staff, not families. Prof. Thomas Lloyd Jones, 60, Nakoma, member of the University of Wisconsin Department of education for the last 17 years and for four years principal of Madison Central high school, died at a Madison hospital about 6 a.m. today. He entered the hospital early last week for an operation for the removal of gall stones, but his weakened condition would not permit it. Since that time he has steadily grown weaker and his death had been expected almost hourly for the last two days. Professor Jones, whose lifetime was devoted to educational work, came of a large family which has produced a line of nationally known men and women in the fields of education, religion, art and letters. 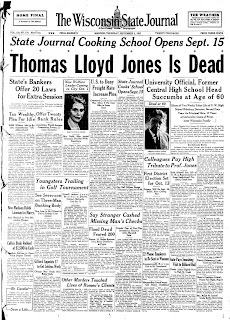 He was born Dec. 19, 1870 at Hillside, son of John Lloyd Jones and grandson of Richard Lloyd Jones, a Welshman who settled near Spring Green in 1844. The five sons and two daughters of pioneer Richard all grew up to establish homes in the community. Jenkin Lloyd Jones, famous as a preacher and lecturer, was an uncle of Professor Jones. Chester Lloyd Jones, professor in the commerce school at the university; Richard Lloyd Jones, former publisher of The State Journal; and Frank Lloyd Wright, architect, are cousins. For four years Mr. Jones was principal of Madison Central high school, but for the past 17 years he has been a member of the University of Wisconsin faculty. While he was an associate professor of education, his work was largely outside the classroom. As head of the department of high school relations, he was chief medium of contact between the university and the secondary schools of the state. He was an advocate of the belief that high schools should train their graduates along lines that would fit them to tackle life's problems without the absolute necessity of higher education.